Sravanabelagola is located 99 kms away from Mysore, in Hassan District of Karnataka, between the large Indragiri hill and the smaller Chandragiri hill. It is one of the oldest and most important Jain pilgrim centres in South India. This place is famous for its 1000 year old Jain statue of Gomateswara (Bahubali). This massive statue has a height of 57 feet, carved out of a single block of granite, standing upright in the posture of meditation, with curly hairs, and arms stretching straight down. This naked statue is symbolic of the renunciation of worldly possessions. This beautifully carved image of Sri Gomateswara is simple, gigantic and majestic. This temple is built atop the Indragiri hill. This splendidly sculpted statue is regarded as the tallest monolith in Asia. You can get a spectacular view of the neighborhood from the top of the hill. 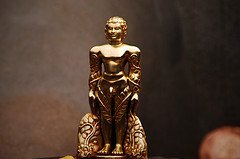 Jainism flourished in this part of the world during 4th and 10th centuries under the dynasties like the Kadambas, the Gangas, and the Rashtrakutas. This mammoth masterpiece of sculpture is the most magnificent work of Jain art to Karnataka. Gomateswara Temple is surrounded by many other Jain temples. The important festival of this temple is Mahamastak-abhisekham. This great religious ceremony is performed once in 12 years when the image of Lord Gomateswara is bathed in milk, curds, ghee, saffron and gold coins chanting of mantras. Millions of devotees from all over the world gather here to witness this sacred event. This year (in 2018),this festival is celebrated from February 18 to 25. The main ceremony during this festival is the anointing ceremony of the tallest freestanding granite monolith in the world - the statue of Bahubali. This Mahamastakabhisheka is performed with 108 kalashas and panchamrutha abhisheka. Over a lakh of devotees to take out procession atop Vindhyagiri hill and five thousand people witnesses this mega event sitting on the attic.